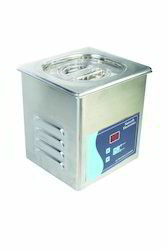 Small Ultrasonic Cleaner is used to clean a number of different objects in commercial and industrial fields. Further, offered cleaner is checked thoroughly by our quality experts to ensure its functionality at client's end. It is provided using high quality components and advanced technology under the supervision of our professionals. Looking for Small Ultrasonic Cleaner ?